classroom lessons as well as staff trainings. See the ​ complete school brochure. ​Starts with a health inventory, as with health coaching. Tonya creates each session with you, based on your needs: physically, emotionally, mentally and spiritually. 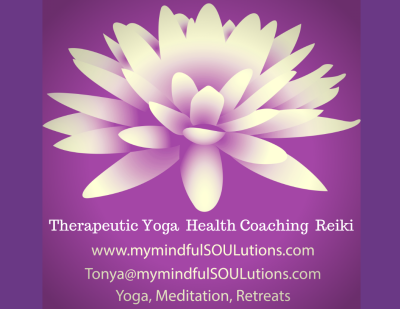 ​Reiki is a gentle healing modality where Tonya's hands are placed on the body (physical or energetic) and healing energy is directed into the body. You remain fully clothed while lying comfortably on a massage table. Rest comfortably while bathed in the healing sounds of Tibetan singing bowls, bells, drums and/or rattles. Sound healing permeates cells throughout the body. It is deeply relaxing and powerful. *Tonya's work is based on neuroscience research and powered by ancient wisdom. 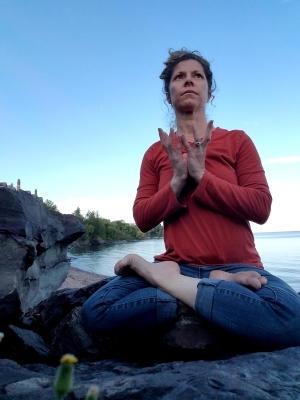 Powerful tools may include: poses, breathwork, yoga nidra, guided imagery, mindfulness, Qigong, positive affirmations, story, essential oils, stones, healing sounds and more!​ Tonya is thoroughly trained and experienced with trauma release. Her work is research-backed to help with depression, anxiety, ADD and addiction recovery. ​​​​Hard to choose between Yoga, Sound Bath, Health Coaching & Reiki? Design your own "potpourri" of health and happiness with your savings package! ​Single session: $60 3 pack: $150 save $30! 6 pack: $270 save $90! ​8 pack: $320 save $160! A meditative class truly suitable for all activity levels and backgrounds! Engage in simple, flowing movements to quiet the mind and restore the soul. Breathe. Move. Relax. Effects you may encounter: decreased stress, increased joy, reduced muscular tension, improved immune system, and the list goes on. . . Begin with an introduction to methods of mindfulness meditation, and continue the journey with practices that are customized to your group & setting! Experience seated, walking, standing, visualization, candle-gazing and gratitude practices, among others. Benefits are limitless! Postures that flow with the breath are partnered with poses that are held for short periods to build strength. Breathing fully throughout is key. Options are always available to adjust the practice to your current needs. This vinyasa class is held at 80-85 degrees, as with a hot WI/MN summer day. The heat allows the body to warm quickly so that postures can be safer and fuller. This is a workout class that encourages water and movement breaks as needed. Self-care is praised! Tonya offers periodic classes & sessions on a volunteer basis for the greater good. She also offers her services within the barter system, when deemed appropriate. The opportunity is extended for you and/or your business/organization to purchase "Karma Classes" for those in need. You may choose a specific desginee or leave the receiver of the gift to fate.